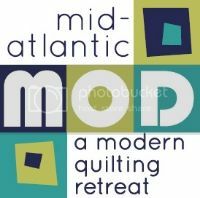 Philadelphia Modern Quilt Guild: Spotlight on... Liz! Hope everyone is able to beat the upcoming heat this week expected in the Philly area! Take a break by enjoying this great interview and fun photos from Liz Hawkins. · What do you do (employment or for fun)? I think this goes under the category of employment AND fun....I run a quilt design biz with my sister-in-law Beth. We started out designing patterns and went to designing fabric, authoring a couple of books for Kansas City Star along the way. Oooh the usual. Kids were babies, needed a creative outlet. Was tired of hot gluing dried flowers and pot pourri. · How old were you when you made your first quilt? In my late 20’s. My mom was always trying to teach me how to sew, but after what I call my 8th grade “bumble-bee t-shirt disaster”, I wasn’t a real fan of the sewing machine! When I actually bought my first machine, my mom just about had a heart attack. I told her if she’d introduced me to quilting instead of clothes-making, I’d have been sewing LONG ago. Color, color, color! And the feel of fabric and they way they all come together. It’s such a fabulous creative outlet. I have a studio in my home. It’s my sanctuary. The place I go for inspiration. Although, I’ll admit. It has to be clean. I don’t mean spotless, just organized enough that I can THINK. It has one wall with built in’s to hold our patterns and fabric. Opposite that is a wall of windows that look out over the Delaware River. Now who wouldn’t be inspired by a view like that? Believe it or not, I actually did learn to love to quilt by hand. (Thanks to my teacher???) I love small projects that I can do handwork on. And I love applique for the same reason. But these days, we’re usually quilting on the machine or sending our quilts out. That’s what happens when you get your sample yardage two weeks before quilt market! Yep. Gotta name the quilts. AND label them. They get sent out to shops for trunk shows, which is extra nerve wracking. We learned early on to label after losing a quilt with FedEx. That was one sad day! Many! I lecture and do workshops all over the country, mostly trying to dispel the bad rap applique gets! But the person I loved teaching the most was my daughter when she was eight, and then a bunch of her friends the summer she was 10. Although, she’s gone to the dark side and now designs and makes clothing. Guess that skipped a generation! I think choosing colors depends on my mood, and also the “look” I’m going for. I LOVE color. And I love mixing colors people wouldn’t think of mixing. One semester of art school I spent traveling through Europe watercoloring. My professors nicknamed me “the colorist” because I saw color in everything. Same goes for quilting...and I love adding neutrals just to make those colors pop. · How do you start a design and turn it into a quilt? Usually something inspires me and I get an idea for a quilt. This could be anything. A word, a line of fabric, something that I love. It starts out as sketches on graph paper (or the paper table cloths with crayons at Macaroni Grill...), with lots of notes. Then it gets transferred to InDesign when Beth writes the pattern. I get to do all the artwork, Beth (poor thing) does the math for piecing and does the actual writing. · How did you get started in the quilting business? My sister-in-law and I shared a love for quilting and one other thing....the same name. We always thought it would be fun to go into biz together, and quilting was one common interest. Once we got the idea in our heads we just went with it. Researched a name, got it trademarked, started a website, printed business cards and whipped out 4 designs while our hubbies had taken the kids on a camping trip to the Grand Canyon! · What can you tell us about fabric design? How did we get started with fabric design? Quilt market. We were approached by a few different fabric companies and decided to give Henry Glass Co. a try. You know all the doodles you sketch when you’re not even thinking about it? You know the ones, on every margin of every notebook you’ve ever owned? Yep. That’s fabric design. Ok not really, but the ideas do start out as a doodle. Again, I normally start my ideas on paper, then finish them up on the computer using Photoshop, Illustrator and my handy-dandy Wacom tablet. Our line that ships this month was actually sketched out during the World Series when the Phillies were in it against the Yankees. It’s called Hip Happy and looks NOTHING like baseball! But it does show the nervous energy I had while watching. And hoping! Fabric design always starts with a “focus fabric” followed by 7 coordinates. Usually I turn in 3 groups of 8 designs and then we choose which ones we want to go with for the next season. I have to say fabric design is my favorite part of what we do! Believe it or not, Amy Butler’s “Blooming” quilt! We saw it last fall in person at Market and just had to make it. It’s not often I get to make something that isn’t for Lizzie B. It’s nice to do something else and remember why you loved the hobby in the first place! Well those are kinda boring since my goals are usually just to get new stuff DONE before the next market! And I’m a HUGE procrastinator as well, so goals are not my friend. My hideously ugly first sampler. Serious. It think it’s too ugly even for a pic, but the fact that I FINISHED it...by HAND! That was an achievement. I have two. Our Lizzie B motto has always been, “Fake it ‘til you make it” since we had NO idea what we were doing when we first started out! And our family motto is, “Always look on the bright side of life”. (and yes, we sing and whistle it together). Hahaaha! Thanks so much, Liz, for taking the time to answer all my questions! Hopefully everyone enjoyed learning more about a fellow guild member. Happy sewing!